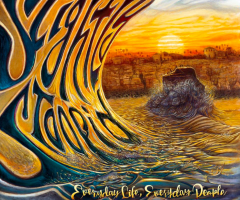 On June 24th, Slightly Stoopid’s School's Out For Summer Tour passed through beautiful sunny, Santa Barbara and played the legendary Santa Barbara Bowl. Pepper got the party started early with energy that was through the roof! Kyle McDonald from Slightly Stoopid came out to help them sing the song “7 Weeks” off their album In With The Old album. My favorite part of the show was watching all the different collaborations throughout the night. Stick Figure came out shortly after and was joined by Kyle again for the song they wrote together titled “Choice Is Yours”. 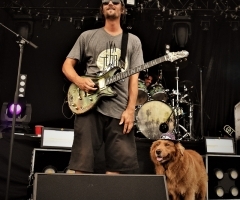 It’s hard not to fall in love with Stick Figure’s live performance when they have Cocoa the Tour Dog running around onstage with them, carrying stuffed animals and popping beach balls. Stick ended their set with one of their hit songs “Smokin’ Love” and had Bret Bollinger of Pepper come back out to help them finish off the performance. Bret expressed how this is Pepper’s very first tour with Stick and how it has been one of their favorite tours to date. Two amazing sets and the night still wasn’t over! 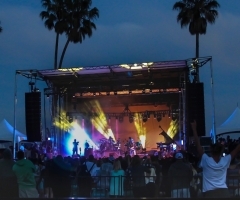 Slightly Stoopid always puts on the most fun and entertaining show. They also had some extra special guest appearances on their set, too. First, Jurassic 5 member Chali 2na came out for a song, and then the legendary and most best dressed man in the business Don Carlos joined them for several songs. 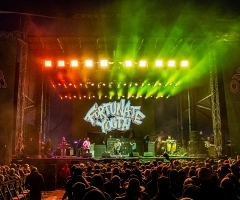 The show ended with an epic collaboration with almost the whole tour package during their song “No Cocaine”. There’s still time to catch this incredible tour before the summer is over!